I really enjoyed this book. I am a fan of travel books, animal stories, autobiographies, and Eastern Religions. This book contains elements of all these genres, and it was a pleasure to read about all of these in a single volume. The author is an entertaining writer who has had some fascinating encounters with animals and people, in some varied locations around the world. The more recent stories are set in Thailand. He describes how his encounters with a diverse range of domestic and wild animals have been influenced by his Buddhist training. He believes all animals should be treated with kindness and compassion. He is clearly a great dog lover. In his fascinating appendix to the book he expands his views on dog training in a cross cultural context. He rejects aggressive training methods and the theory that dogs are in struggle with owners for dominance. He points out that dogs, are genetically speaking wolves, and large breed of dog can breed with wolves and produce fertile offspring, which means that they are the same species. He argues that dogs can be trained humanely by working with their wolf-like instincts. One feature of this approach is teaching your dog to come off lead, by running away from it and making it want to chase and play with you. Mini play sessions after a recall can be supplemented by a treat. He insists that early in the training, every recall which succeeds should be rewarded. He disapproves strongly of ineffective dog owners who fail to exercise, train or communicate with their dogs. He points out that if the owner of a pet dog does not actually enjoy time with the dog, there is really no point of having one. The author’s Buddhist orientation is clear, when he advocates setting time aside each day for simply meditating with your dog, and enjoying calm and quiet times with it. This deepens the bond between dog and owner, and opens up the possibilities of non-verbal communication with the dog. Despite the focus on animals, the author’s meetings with people are also entertaining and revealing. In working with elephants, he meets mahouts and their families. He meets animal loving Hindu and Buddhist monks and nuns in temples both in East Asia and the West. He travels to Penang in Malaysia to Chinese Martial Arts Centre and there he befriends the Master’s supposedly savage guard dog, which everyone else is afraid of. He meets a rescuer of Water Buffalo near his home in Thailand. This kind man buys old and sick water buffalo which are about to be slaughtered. He takes care of them on his land and nurses them back to health. The author’s wife is an experienced water buffalo handler and she also supplies one of the most endearing stories in the book, from her childhood. Her family were very poor and often went hungry, but Nin, their devoted farm dog would go out and steal food, including chickens, to feed the hungry family. She even came home with small bags of food which had clearly come from the village shop. No one was sure whether the food was stolen or donated. 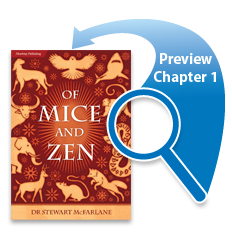 In summary, I greatly enjoyed “Of Mice and Zen”, and will be recommending it to others. This is an enchanting and inspiring collection of true stories from an animal lover, Buddhist Scholar and Tai Chi Master, who has spent many years living and training in East Asia. He believes that respect and care for animals and nature form the core of what makes us worthy as humans. He describes how encounters with some large and potentially dangerous animals, are handled with equanimity and compassion, including elephants, sharks, aggressive guard dogs, snakes, water buffalo and monkeys. He also describes how his Buddhist and Taoist influenced methods of training some difficult and wayward dogs, have transformed them into delightful and biddable companions. He rejects violent methods and overbearing notions of dominance in the training of dogs, and points out that wolves in natural packs actually work cooperatively and are highly social animals, which rarely resort to aggressive behavior. He argues that by discretely redirecting and channelling many of a dogs’ basic wolf like instincts, they can be guided to become reliable and responsive companions or working dogs. A simple example of a dog which likes running away to hunt wildlife or livestock, or likes chasing vehicles, can be re-directed to playing running games with the owner. The dog is encouraged to follow and chase its owner in return for more attention or treats. By playing chase, the dog is being subtly encouraged to come back to the owner, and to regard the owner as a source of fun and positive interaction. This simply builds on a dog’s instinct to run and chase game, or run and chase family and pack members, to be in on the action. The human owner needs to be where the action is for the dog. Then the dog will follow you, seek you out and want to be around you to respond to positive commands. This and other examples make the book informative, as well and providing delightful stories with a range of fascinating animals. His attempts at directing elephants at a camp in Thailand were less successful, as he freely admits; pointing out that elephants are even smarter than dogs, and can be more devious. He does not claim to be an elephant trainer, just someone who cares about elephants. The author argues that elephants should not be domesticated in future, and should be left protected in the wild. But in the meantime, the existing stock of domestic elephants, have to be cared for with respect and compassion. The author’s respect and concern for wild animals encountered on his travels, shines through. Reading this book is a real pleasure, and reminds of the delight I found in reading Gerald Durrell’s, “My Family and Other Animals” many years ago. Like the animal encounters, many of Dr McFarlane’s interactions with humans are also funny and inspiring. He relates dialogues with building site workers, gypsies in Market Gardens, field hands and cowherds in Thailand, and various monks and nuns in Asia and the West. These are related with the warmth and humor of a natural storyteller. I enjoyed this book immensely and like the works of Gerald Durrell, I shall enjoy reading it over many times. The book discusses the contrast between two very different kinds of arguments on the issue of Buddhism in relation to environmental issues. The first is an Eco Buddhist perspective that stresses the urgent relevance of Buddhist practice to environmental issues. Some representatives of this view are Martine Batchelor, Christopher Titmuss and Peter Timmerman. The second is the Anti-Eco Buddhist perspective, represented by Ian Harris. This perspective regards the basis for the concern with environmental issues as not legitimately Buddhist. It is supported by Hakamaya Noriaki, the pioneer of the movement known as “Critical Buddhism”. Hakamaya extends the argument to say that the supposed Buddhological basis for much reflection on Buddhism and the environment is based on a misinterpretation of Buddhism. The book also discuss the difficult issue of whether the morality tales and the mythic utopias and dystopias found in the Kutadanta-sutta, Cakkavati Sihanada-sutta and Agganna-sutta, can be legitimately employed by Eco Buddhists, as guides for ethical, social and environmental concern. McFarlane argues cogently that these texts make a clear connection between human responsibilities to each other and the natural world in this current existence. He points out that the texts clearly show that the flourishing of Buddha Dharma and the flourishing of humans, other species and the natural world in are directly related. The basic message is that surrendering to greed, hate and ignorance, have practical, environmental, as well as karmic and spiritual consequences. It is a message about the right action in this life and this realm of existence. Many supporters of the Eco Buddhist view frequently cite the Hua Yen teaching of interdependence and mutual entailment of dharmas, and Ch’an/Zen teachings on Buddha nature, in support of Buddhist ecological thinking. The author points out that it is one of the ironies of the contemporary debate, that the teachings which are frequently cited in support of a Buddhist ecological world view and basis for environmental action; are precisely those which Hakamaya Noriaki condemns as non-Buddhist. Furthermore, Hakamaya sees the supposed Japanese value of harmony with nature, based on such notions, as simply a retreat into quietism, and a justification for inaction and ethical stagnation. He regards the uncritical conflation of “Buddhist” teachings of Original Enlightenment with an undifferentiated Tao, and Chinese concepts of nature and spontaneity as having undermined the distinctive character of Buddhist causal analysis or conditioned arising (pratitya samutpada). McFarlane points out that Hakamaya’s claim that all teachings of Buddha-nature, tathagatha-garbha and Hua Yen Dharma theory are substantivist, needs to be challenged, given the extensive non-substantivist qualifications offered in the texts themselves. The author describes the tendency of the Anti-Eco Buddhist scholars to commit the error of “ultimatism”. Ultimatism, as identified by Lance Cousins, is the error of regarding the supposed ultimate concerns of Buddhism, specifically, the higher teachings, as constituting the whole of Buddhism; and consequently downgrading popular practice. Ultimatism tends to dismiss or ignore the way Buddhism has actually engaged as a lived tradition in Asian societies. An intriguing book that confronts the Anti-Environmentalist views of Buddhism head on, and offers a well-supported defence of Buddhist Environmentalism.